Garfunkel sing a hymn to nostalgia. Nothing gives me as much pleasure as finding connections where they are least expected. The comic actor Amácio Mazzaropi (19121981), screen personification of the crafty caboclo Jeca Tatu, made an appearance in these pages earlier this week, and here he is again. Era uma coisa divertida de se ver. Era uma coisa muito linda de se ver. Era uma coisa brasileira dando IBOPE. You can listen to Jean & Paulo Garfunkels 5-minute live recording of this moving toada in the anthology UMES Cantarena 1. 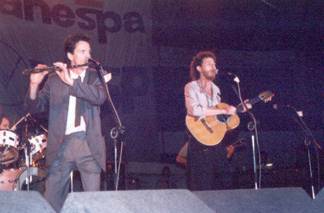 Opening their recent CD Com Pacto Duplo, the brothers studio version is even better. 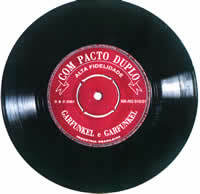 A little masterpiece, Mazzaropi has been recorded several times beforeby the Garfunkels with César Brunetti and Celso Viáfora, by Pena Branca e Xavantinho (twice), and by Trovadores Urbanos. In Com Pacto Duplo the song is arranged as a vocal duet with guitar and clarinet accompaniment that pays tribute not only to the actor but to Nino Rota (whose Amarcord theme is quoted) and to Angelino de Oliveiras Tristeza do Jeca (listen to part of Ney Matogrossos recording). Like the Garfunkels, Mazzaropi was a city-bred paulista who took on a caipira persona. He was also a good singer who included songs in his movies, including Tristeza do Jeca in the eponymous film of 1961. The songwriters declaration is borne out by Com Pacto Duplo, a disc featuring a variety of musical styles (although heavy on the country accent) with arrangements by Roberto Lazzarini, Sizão Machado, Bocato, and Mozar Terra. A good distance away from Mazzaropi is Yara, an ethereally romantic song that progresses from a dreamy opening reminiscent of Baubles, Bangles and Beads into a vaguely oriental creation in Francine Lobos astonishing voice. Que tu é, um homem ou um camundongo?" E o que será que eu respondo? (Rainbow Records RR-RG 010/01; 2001) 41:45 min.